Ailefroide is the 2nd biggest French mountaineering area after Chamonix. mountaineering, bouldering, climbing (mythical routes), hiking, Via Ferratas, canyoning. Ailefroide is on the border of the Ecrins National Park. You can, without having to use your car, take paths leading you to refuges, traversing the tracks of chamois and marmots in their normal habitat lined with orange lily and martagon flowers, and perhaps if you’re lucky and keep your eyes peeled you’ll spot the Isabelle butterfly, a very rare species. The Ailefroide forest is one of the last to protect this type of butterfly. From Ailefroide you can rejoin one of the refuges (Glacier Blanc, Ecrins, Pelvoux or Sele), spend the night and get an early start on one of the prestigious surrounding summits : the Pelvoux traverse and the descent by the Violettes glacier, la Barre des Ecrins, Roche Forio, the Neige Cordier pic, etc. 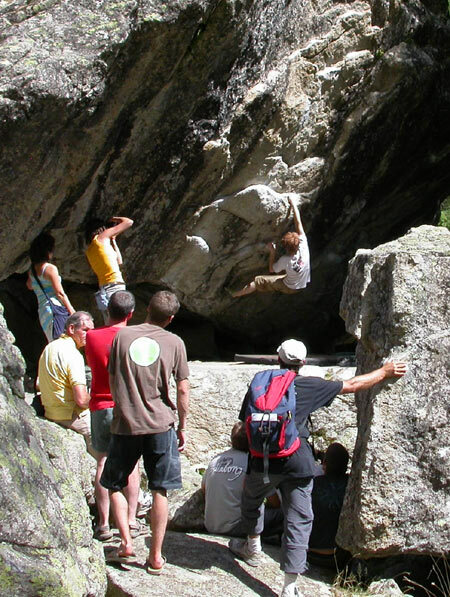 In the climbing world, Ailefroide is renowned as one of the most beautiful natural climbing spots. Whether you’re a beginner or experienced, whether you prefer long routes or boulders, without doubt you’ll find you’re ‘bonheur’. Ailefroide played host to the first International bouldering meet a few days before the world cup in Argentina. Originating in Italy, these routes are a mixture of hiking and climbing, secured with cables, steps and ladders, they enable you to climb to great heights. Come down the mountain via the torrents, jump into water basins, edge one’s way into the canyons… for white water sports amateurs : high sensations guaranteed.